Zachary Pali Jr. dies, 1919. MY CHILD, ZACHARY PALI JR., HAS GONE. Mr. Sol. Hanohano, Editor of the Nupepa Kuokoa, Aloha kaua:—Please allow me in your boundless patience an open space of our tireless pride to carry this sad news all over the islands so the the multitude, the family and friends living from where the sun appears to where the sun sets at Lehua. On the 9th of July of this year, at 5 o’clock a. m., we met with a letter informing us that our child, Zachary Pali Jr. had gone on the road of no return. Auwe, how painful and sorrowful, and we did not see how he looked when the beloved body of our dear child was left in foreign lands, at Chicago, Illinois. Our beloved child was born in Kaunakakai, Molokai, from the loins of Mrs. Rose Pali Kamohakau, in the year 1897, July 22, and he spent 22 years, 7 months, and 17 days old breathing in the cool and pleasant air of this earth, when his life spirit give by God glided off, leaving his body for the bowels of the earth; for the body of man is a bit of dust, and dust returns to dust. On the 9th of May of this year he left his friends, and left as well his parents and family, who are mourning and heavyhearted. May beloved child left his homeland, and went with his musician friends on the 8th of December 1916. My dear child and friends went around different cities totalling 125, and went back to Chicago, Illinois, leaving his cold body for the bowels of the earth. Auwe, how regretful and saddened I am for my child, my dear child of my youth. Auwe for my beloved one! God blesses us all, and it is He who will lessen the sorrow and sadness that weighs upon us. Let us give much glory to God, for it is He who creates and He who takes away. With much appreciation to the Editor and the workers. Ka Nupepa Kuokoa, Buke LVII, Helu 29, Aoao 4. Iulai 18, 1919. John Kahawaiolaa passes on, 1919. OUR YOUNGER BROTHER, JOHN KAHAWAIOLAA, HAS GONE. Mr. Sol. Hanohano, Editor of the Kuokoa, Aloha oe: Please extend your patience in allowing an open space of our tireless precious one, and it will carry around the sad news to all the islands of Hawaii nei, and the family, the associates, the friends, and the laborers from the appearing of the sun at Kumukahi to the taking of the sun at Lehua. John Kahawaiolaa was born in Hanamaulu, Kauai, on the 28th of February, in the year 1889, and he was 30 years, 4, months, and 7 days old; and he left behind his birth mother [luaui makuahine], and his sisters and one older brother grieving with heavy heart for him. The words of the Great Book are realized: dust to dust, and the spirit to the one who created it. In closing these bemoaning and heavy thoughts for my beloved younger sibling [pokii], I ask that the ohana, friends, coworkers, and bosses of our beloved younger brother who left this life behind, to take our boundless thanks for all of your gifts of flower lei to honor the remains of our beloved pokii, and for your meeting with us at the funeral, and may God help us all, amene. John Kaalouahi dies at Kalaupapa,1924. REV. JOHN KAALOUAHI HAS GONE. He was born at Koae, Puna, Hawaii, in March 1858. He died at Kalaupapa, Molokai, on the morning of Wednesday of last week, Aug. 13, 1924. He was 66 years old when he left behind this life. He served as reverend for Halawa, Molokai for 30 or more years, and it was this sickness of body that took him away from his church, and he resided at Kalihi Hospital for one year and then was taken to Kalaupapa. He spent 6 months at Baldwin Home in Kalaupapa, and he passed away. He leaves behind 8 children who grieve for him, 2 boys and 6 girls, along with grandchildren. Five are here in Honolulu, two on Molokai, and one in Hilo, Hawaii. Ka Nupepa Kuokoa, Buke LXIII, Helu 36, Aoao 6. Sepatemaba 4, 1924. Lately I have just been curious, so if you could take (less than) a minute to answer this short survey, I would appreciate it! Evelyn Pihana Loaaole passes on, 1924. …the life of man is but a puff of smoke which appears and disappears, it is God who giveth and He who then taketh away. Blessed be his name. After being ill for four days, my dear wife left me, her kane, and our hanai child. On the 27th of Feb., she was taken to the Queen’s Hospital by the doctor, and that evening at 7 o’clock she grew weary of this life, and her spirit returned to He who created it, and her body went under the care of Silva, and on the first of March her body was taken out for the family, the acquaintances and friends of my dear wife to view. I, her husband, give my thanks to all the family and to the association, Ka Hale o na Alii o Hawaii, for your helping me from the watching over the body of my wife; and to the friends who came and stayed awake through that night with us, and also for the gifts of flowers. Please accept this expression of thanks, and may the Lord bless us all with aloha. 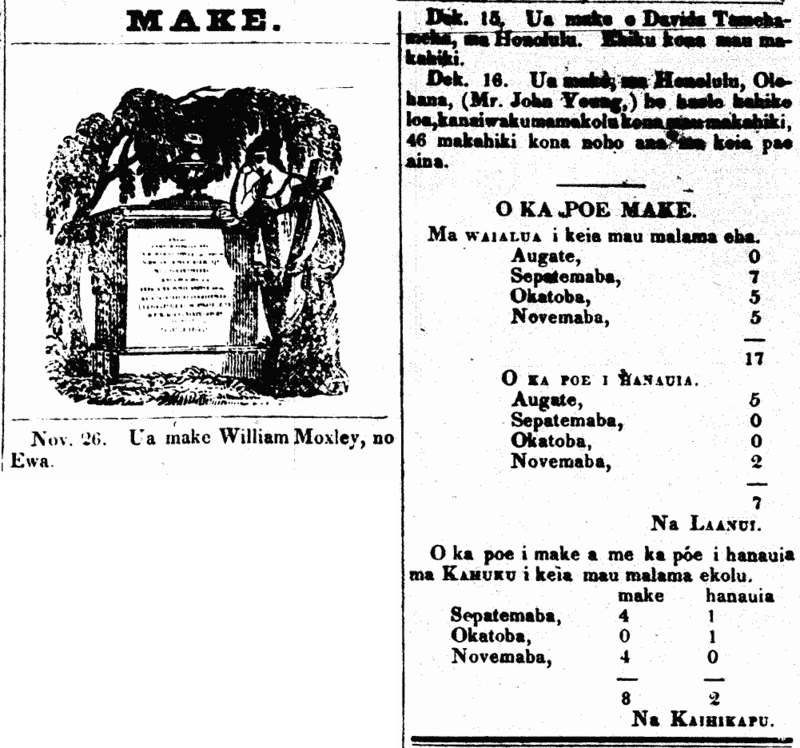 Ka Nupepa Kuokoa, Buke LXIII, Helu 13, Aoao 6. Maraki 27, 1924.